UNITED NATIONS, Jan 14 2019 (IPS) - The world’s developing countries, comprising over two-thirds of the 193 UN member states, are complaining they are not being adequately represented in the higher echelons of the world body –- despite competent candidates with strong professional and academic qualifications vying for these jobs. While the UN is being commended for ensuring equitable representation of women in recent years, it still stands accused of neglecting qualified nationals of developing countries, including from Asia, the Middle East, Africa and Latin America and the Caribbean. The high-level jobs go mostly to nationals of either Western nations, big donors or the five permanent members of the UN Security Council (P-5), namely, the US, UK, France, Russia and China. “Every Secretary-General, with no exception, caves into the demands of big powers,” one Asian diplomat told IPS, “These countries think high-ranking UN jobs are their political birthright”. Addressing the UN’s Administrative and Budgetary Committee (Fifth Committee), and speaking on behalf of the G77 and China, Karim Ismail of Egypt, told delegates last November that equitable geographic representation is key to ensuring the Organization’s international character and its Member States. Urging the Secretariat to expedite efforts in this direction, including the representation of troop- and police-contributing countries (TCCs/PCCs), he called for more transparency in how geographical representation is measured and the basis for such assessment. “The Assembly needs more complete and easily understandable information on how gender parity and geographical representation are reflected in the 38,000 posts across the Secretariat,” he added. The high-level posts include Under Secretaries-Generals (USGs), Assistant Secretaries-Generals (ASGs), Directors (categorized as D-1s and D-2s), heads of UN peacekeeping missions overseas, mostly based in Africa, and Special Envoys of UN Secretary-General Antonio Guterres. According to a system of geographical balance, when the secretary-general is from a Western nation, the deputy secretary-general is from the developing world, and vice versa. Currently, Amina Mohammed from Nigeria, holds the second highest ranking job in the world body, next in command to Guterres, a former Prime Minister of Portugal. An organization cannot talk about putting performance at the heart of human resources management and selection, if nationality continues to be a key consideration at senior levels, he pointed out. Linked to this, he said, is the ongoing revolving door between the General Assembly and senior staff positions, for which there is no cooling-off period, and which undermines the independence of the UN. and will not mean much. The biggest contributors to the UN’s regular budget, who stake their claims for top jobs, include: the US, China, Japan, Germany, France, UK, Italy and Russia. Amongst Asian countries, China (a member of the G77) and Japan (although Asian, but not a G77 member, still wielding economic clout as a major donor) are both favoured in senior UN appointments. But Asia is not merely China, Japan or India, one of the world’s most populous nations. Jayantha Dhanapala, a former Under-Secretary-General for Disarmament Affairs, told IPS it is widely known that the UN adopts a pro-active policy towards recruiting Japanese by sending head-hunting teams to Japan acknowledging the major financial contribution Japan makes. “This needs to be done with others too so that talent can be spotted. There are major gaps in Human Resource recruitment within the UN, with the West getting the plum jobs, although progress has been made with regard to the recruitment of women redressing the imbalances of the past”, he added. Asked who should be blamed for the continued under-representation—whether it should be Guterres or member states, former UN Assistant Secretary-General Dr Ramesh Thakur, emeritus professor in the Crawford School of Public Policy, Australian National University, told IPS: “Both– but mainly member states”. He said Asian countries need to do two things. (1) lobby for their own nationals, and, (2) lobby for the Asian group as a whole. For example, he said, they could demand that, as the UN University is the only part of the UN system that has its global headquarters in Asia, the Rector (USG rank) must always be an Asian. In point of fact, only one Rector has been Asian, one Latin American, zero African, and four from West European and Other States (as categorized by the UN). Dr Thakur said there should be a demand by member states for a report, every two years, by the Advisory Committee on Administrative and Budgetary Questions (ACABQ) on regional representation in the ranks of USG, ASG and D2. 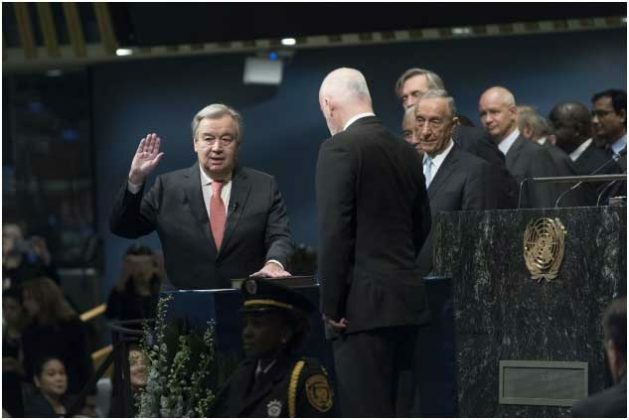 “The very fact of having to provide this documentation will make the Secretary-General and the UN system much more sensitive to the inequitable representation,” he declared. In the current unusual situation, he pointed out, two UK citizens now head two Secretariat Departments (Humanitarian Affairs and Global Communications) while a citizen of New Zealand heads Management, Portugal heads the office of legal affairs, France keeps heading the Peacekeeping Department (since 1996) and China holds Economic/Social Affairs. The US traditionally heads the Department of Political Affairs, and Russia heads the UN office in Vienna, after earlier heading the office in Geneva. Initially, appointments from key countries were made selectively by the Secretary-General based on the merit of presented candidates. Sanbar also pointed out there were some illustrious USGs—irrespective of their nationalities—- because of their superlative credentials. For example, he said, Brian Urquhart was the most distinguished head of the Peacekeeping Department regardless of his solid U.K. citizenship. So was Bernard Miyet of France. Similarly, were other heads of departments from developing countries like Sergio Vieira de Mello (Brazil), Jayantha Dhanapala (Sri Lanka) and Nitin Desai (India), said Sanbar, who served under five different secretaries-general during his career at the UN. “Our inspiring Dag Hammarskjold reportedly quipped: The U. N. needs the big powers to survive and small powers to succeed,” declared Sanbar. Meanwhile, the 53-member Asia Pacific Group accounts for about 27 percent of UN member states and over half the world’s population– but still constitutes only around 17 per cent of the Secretariat’s international staff. Pointing out these discrepancies, Mahesh Kumar of India told the Administrative and Budgetary that while the UN Charter puts equitable geographical representation at the heart of human resources management, challenges continue to persist. He said out of a total UN Secretariat staff of 38,000, less than 10 per cent are covered by the system of desirable ranges. Even for these 3,600 posts, 64 countries are listed as un-represented or under-represented and 50 of these 64 are developing countries. Further, the number of member states in the category of un-represented or under-represented continues to increase since 2014. In addition, nearly 60 more developing countries are close to the lower level of their desirable range of representation and remain at risk of slipping into the under-represented category, he said. “These numbers paint a very stark picture of the current inequitable representation,” he said. He complained that regional disparity remains especially stark at senior level positions, adding that in peacekeeping positions too, the regional disparity is glaring. Nearly half of the Force commanders — six out of 14 – are from Western European and Others Group, comprising only 14% of total member states. Currently, the five biggest troop-contributors to the 90,000-strong UN peacekeeping force overseas include: Ethiopia (7,597 troops), Bangladesh (6,624), Rwanda (6,528), India (6,445) and Nepal (6,098). In contrast, among the P-5 countries, China is the 10th largest troop contributor with 2,515 troops, France ranks 31 with 729, UK ranks 36 with 618, Russia ranks 68 with 85 and the US ranks 77 with 51 troops.